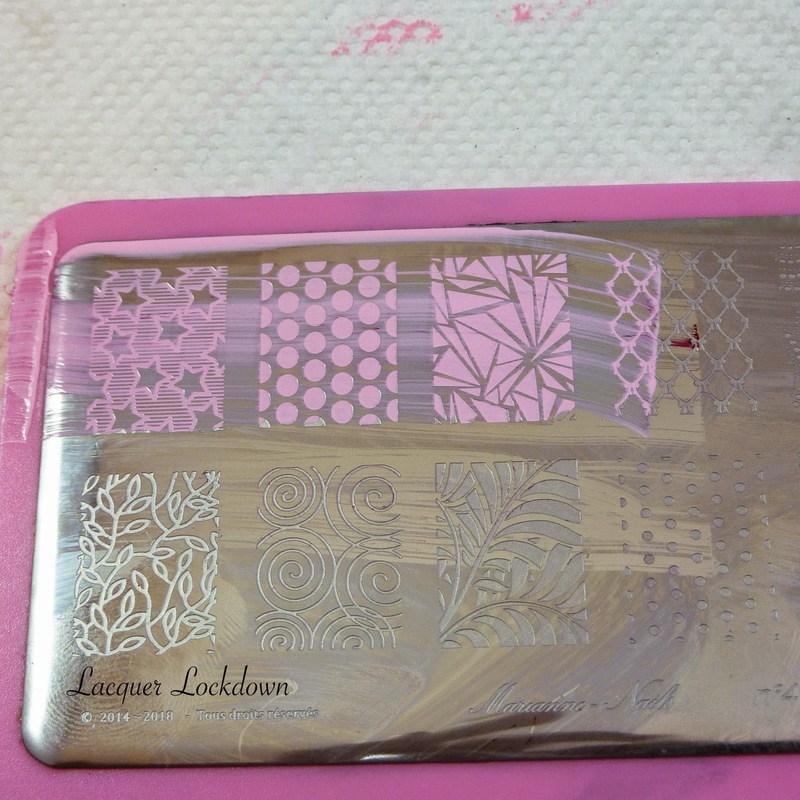 Lacquer Lockdown: Lesson Lockdown: How To Create Double Processed/Double Processing Nail Art! 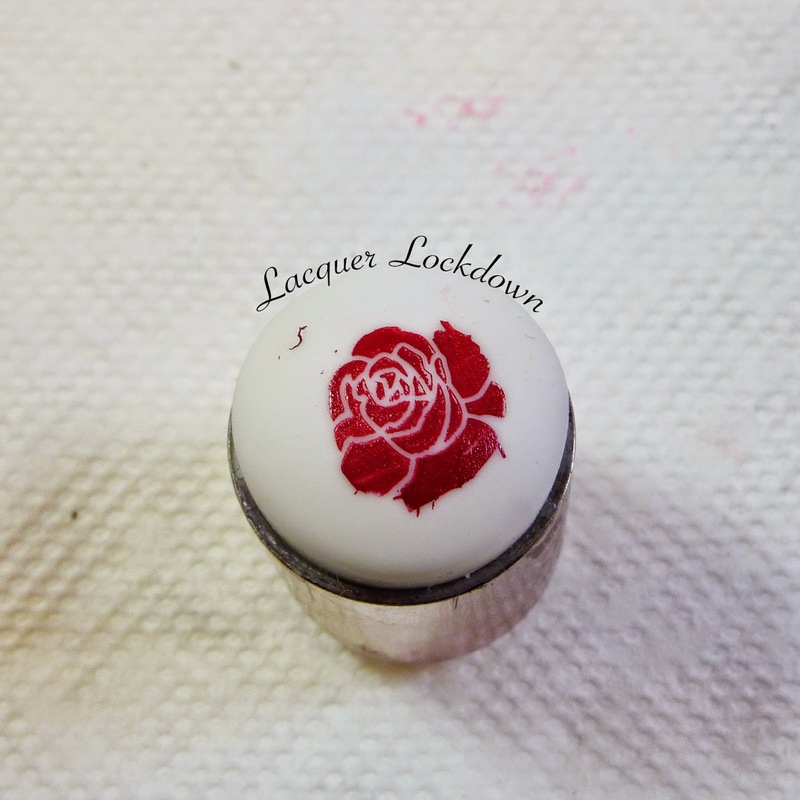 Lesson Lockdown: How To Create Double Processed/Double Processing Nail Art! Today I'm going to show you a new technique I discovered through a nail friend and a true creative powerhouse Joey Helland. Regardless of what she says this lady is truly amazing! Anyone who can come up with these techniques, raise two children, act as a wife, and hold down a job gets all my respect and admiration in the world. I'd be napping lol! Anyhoo she created this technique and named it Double Processing which is an entirely accurate description. Essentially is a stamp that you process twice! Eh? Yeah I know when she first tried to describe this technique to me even with pictures I was like um....Yup total confusion and dismay. I kept looking at her pictures expecting an epiphany and when that didn't happen I just decided to try practicing and see if I could produce the results by trial. Luckily I was able to and discovered that this technique is pretty awesome once you have the basics that is! So I decided to create a little video tutorial and a verbal breakdown a alongside the process so let's go! As I stated previously double processing is literally a technique where you pick up a single image from a plate and apply it to your stamper. You then take another image from the same or a different plate, however it cannot be the same image otherwise this technique won't work, and apply it on top of your previously stamped image right on the stamper. 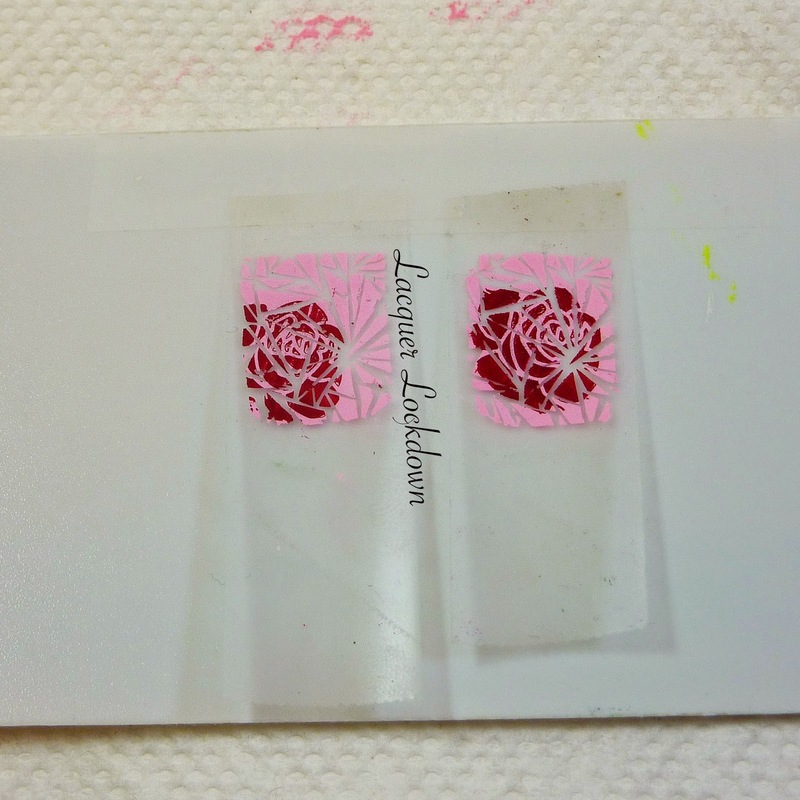 You then transfer the whole image which is on the stamper over onto your nail. If done correctly this should produce an image of two patterns seemingly blended together into one cohesive design. Almost but not quite like a picture in a picture. How is Double Processing Different from Double Stamping? Great question! (Yes I realize I'm basically asking myself this question but play along ;) Double stamping, which you've seen me do many many times on this blog is a much simpler process. With double stamping you pick up a single image and stamp it onto your nail. You then pick up another image either the same or different as it really doesn't matter and stamp it onto that previously stamped nail. In short you stamp twice. but between each image you pick up you stamp it onto your nail first and then follow it up with the second stamp. You create a layer. That's different from double processing. I very carefully avoided the word layer in the description of double processing because the goal is to create a single cohesive image from 2 different patterns and then take that single image and transfer it to your nails from the stamper. You savvy? No well neither did I at first so let's go back and take it step by step. 1. Select plate and image you wish to stamp. 2. 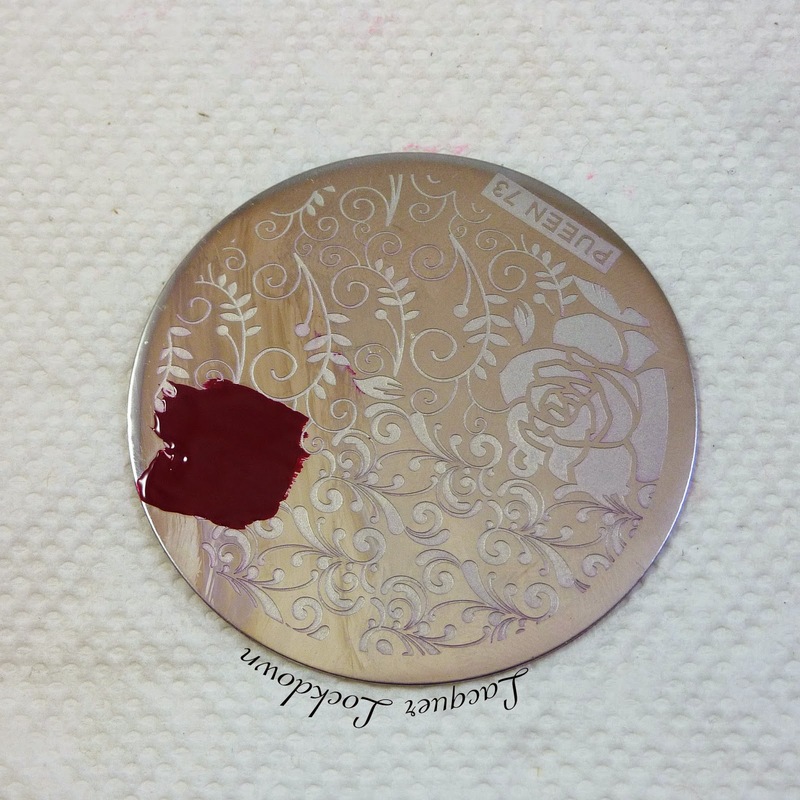 Apply stamping polish to plate. 4. Pick up image with stamper. 5. Apply image to nail. 7. Apply image to previously stamped nail. So then how do I double process stamp? 1. Select 2 plates with images you wish to stamp. This gets a little tricky but try to select patterns that compliment each other. Here I'm using Pueen 73 and Marianne Nails MN44. 2. 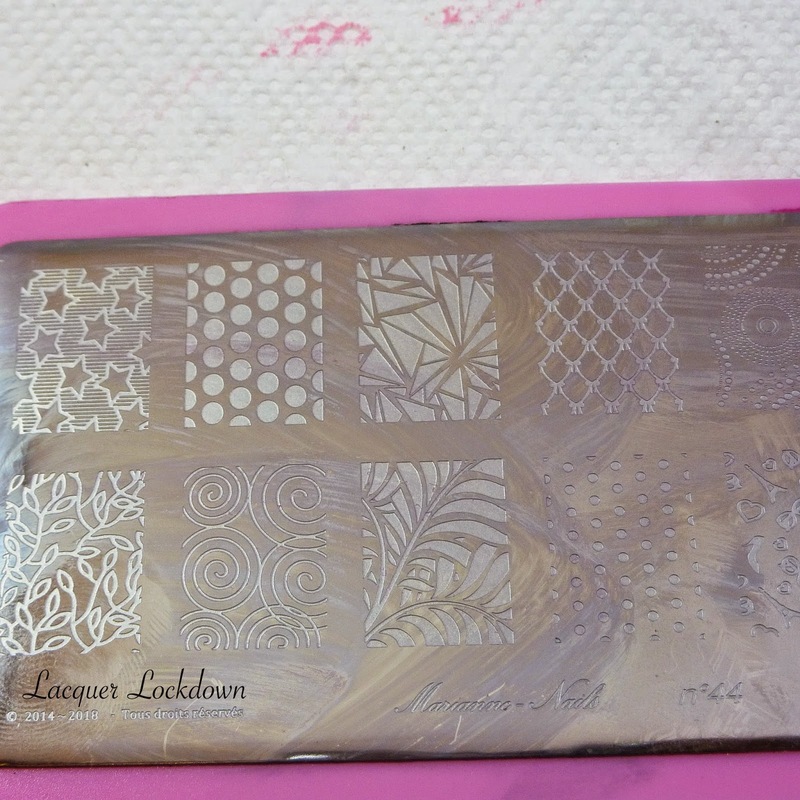 Apply stamping polish to plate with 1st design you have selected. This will be the "inner design" for lack of a better description. You need to know that you will be using two different, hopefully coordinating but hey to each their own, colors of stamping polish. Remember you want these colors to stand out from each other so if you choose colors that are two similar everything will get muddled together. For the inner design I chose a the smaller rose off of Pueen 75. Easy you know how to do that right? Here you may have to remove extraneous elements that aren't consistent with the single image you want to pick up. If that happens you can take it off with tape like I did in the video. 5. 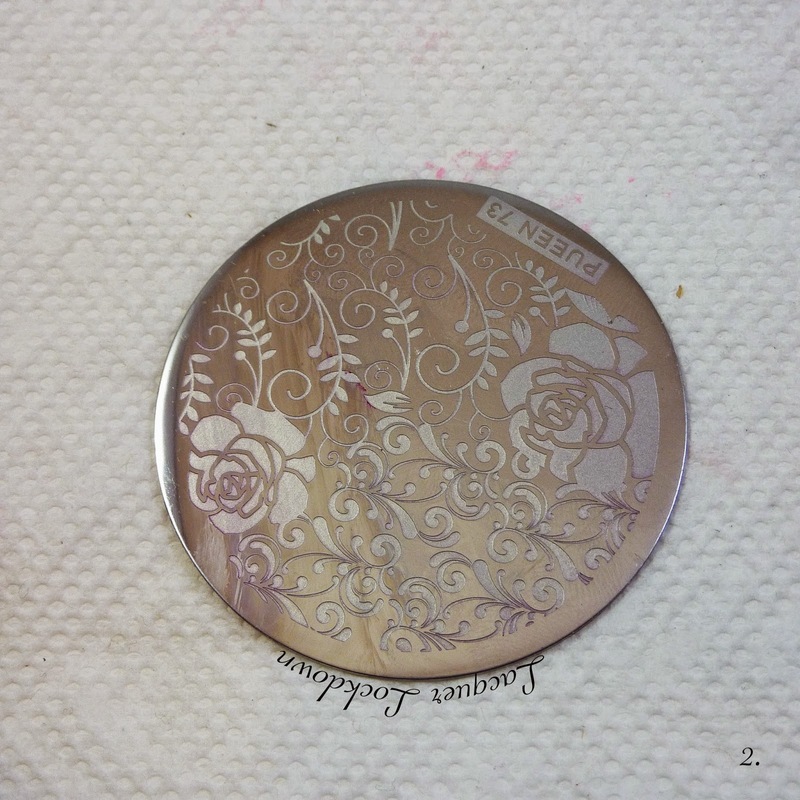 Apply stamping polish to plate with 2nd design you have selected. This will be the "inner design" for lack of a better description. This image will be the "outer or encasing" design that will hold the inner design. In this case I chose the shattered pane image from MN11. Now this is the part where you should notice the remains of your "inner image" i.e. the 1st image you picked up left behind on the plate with the 2nd image. There will only be portions o the image and that's exactly what you want! When you take a look at the stamper you won't see anything but the back of the 2nd image you picked up. Again this is exactly what you want!. 8. Apply image to nail. Uh duh stamp as usual. It should look like this if you picked it up with tape. 10. Apply topcoat and you're done! Pretty cool huh? Don't forget you need to be fast as always when stamping. If not the polishes will dry up on the stamper and will not completely transfer to the nail. You don't want that so practice a few times first to get the hang of it before trying out an entire mani. If this was still confusing for you no worries! I also created a video tutorial to help you out. Personally as I said earlier when I read the description of the process and saw the completed pictures I was still confused which is why I created the video along side the post. 1. Use colors that will stand out from one another so that you can see your designs well. 2. Remember the base color of your nail should be factored in as well! That's why I chose Con Limon as the base for these 2 colors. 3. Be fast but precise. Getting sloppy will ruin the final look so make sure everything is put together well before stamping onto your nail. 4. Choose plate patterns that play well together. 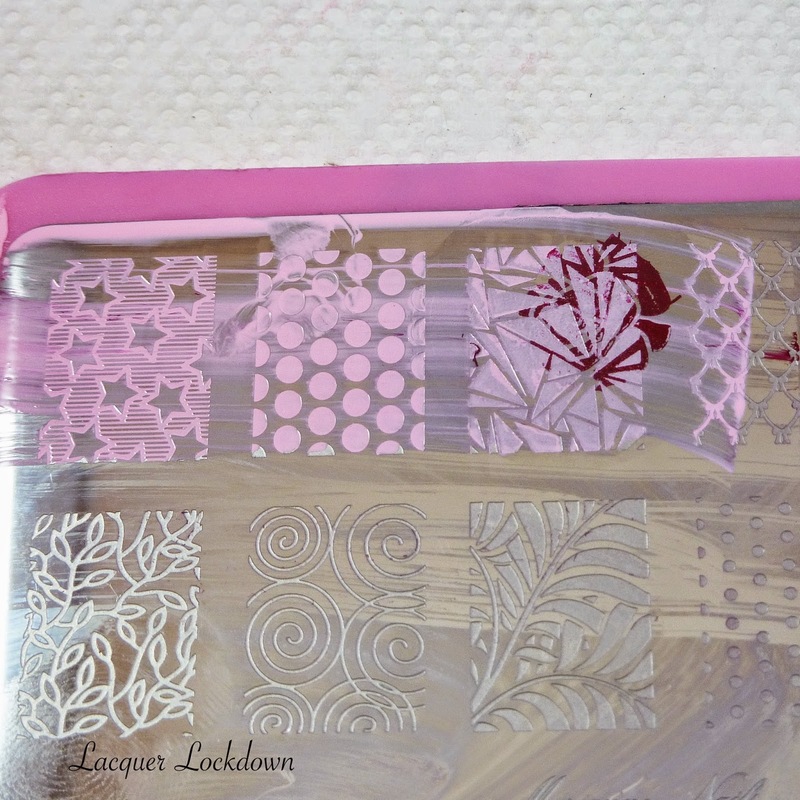 You can practice with scotch tape and the stamper like I showed you in the video. 5. 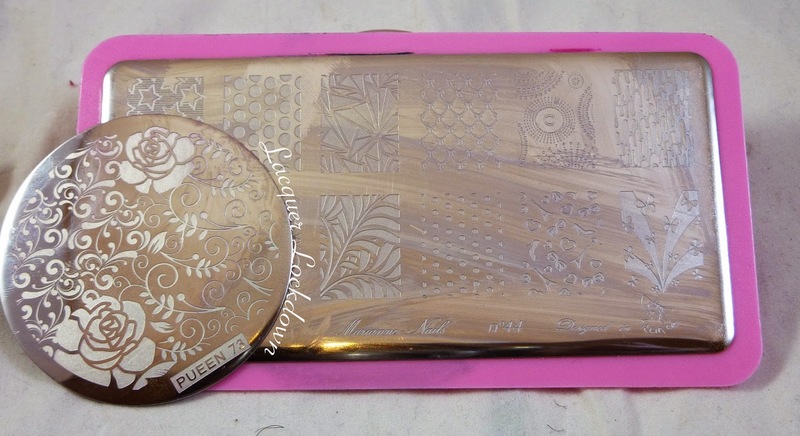 If you aren't fast enough to get the image stamped onto your nails you can always try putting a layer of foil glue over your nail first and then transferring the double processed image. 6. Remember practice makes perfect. It took me a few attempts to master this look, but it was totally worth it in the end. Love this look! Definitely different from stamping twice. Also liked the tip of testing the look of the finished product by picking up with the tape first. Awesome, the video helped me alot with understanding this technique. You're welcome sweetie :) Lol yeah I tend to do a bit of that skipping around myself. I just could not figure out how to do this technique though because the post was really confusing. At the end I was like gahhhh I need to try this myself so I can figure it out!